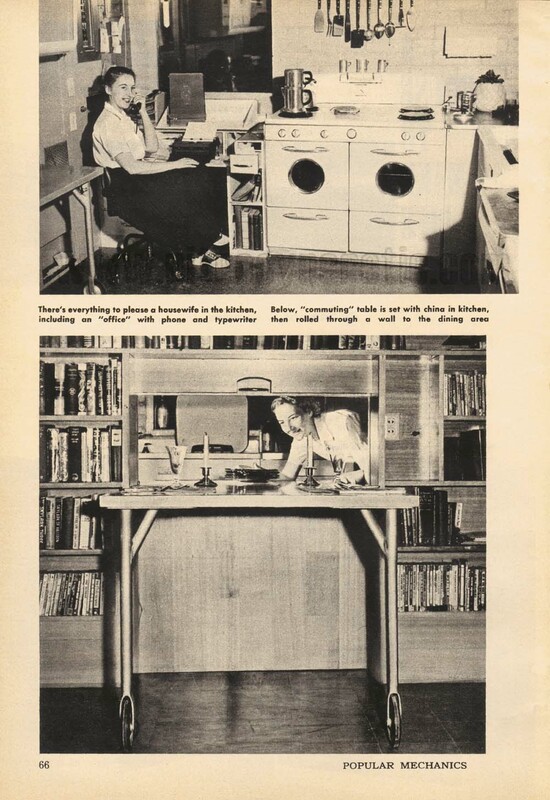 A 1952 issue of Popular Mechanics has an article about Robert Heinlein’s 1,150-square-foot home in Colorado Springs, Colorado, which he designed for extreme efficiency. For instance, a table rolls between the kitchen and the dining room to make it easy to set and clear tableware and food dishes. Skylights have mirrors to reflect more light into the rooms. Most of the furniture is built in. 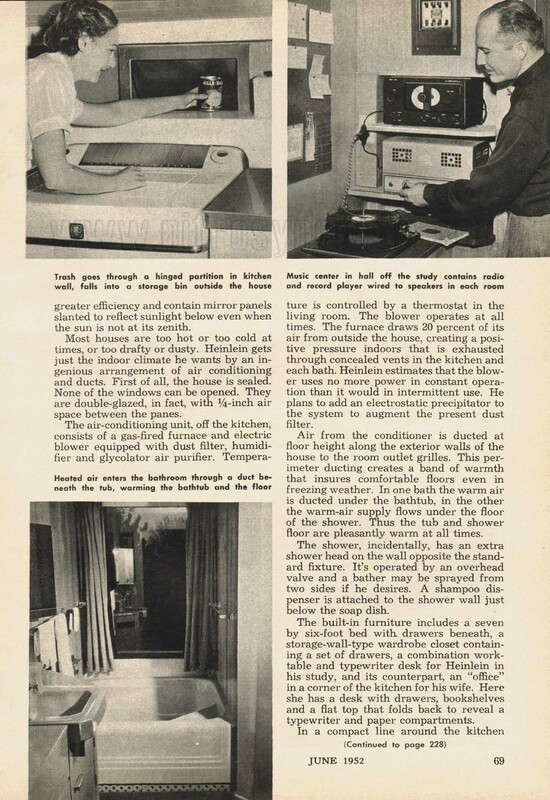 “The built-in bed with storage drawers beneath it, the built-in divans that can be converted to extra beds and all the other furniture are built right down to the floors,” Heinlein says. “There is nothing to clean under. “There are no rugs or any need for them. All floors are surfaced with cork tile that provides a warm, comfortable and clean footing. Nor are there any floor lamps or table lamps. The illumination is built into the house. General lighting for the living room comes from cold-cathode tubes concealed behind a box molding. These illuminate the ceiling. Adjustable wall spotlights are located at all work and relaxation areas in the house. All electric convenience outlets are at a comfortable hip height. I’m through stooping over to the baseboard whenever I want to plug in an appliance. “In 1950-51, the Heinleins built a new house in the Broadmoor district of Colorado Springs. Being a newly developed area, they were allowed to choose their own house number. It will surprise few that they chose 1776. “This article was written shortly after the completion of the house, and shows off Heinlein’s innately clever design abilities. Many of the features are now common in more recent houses. Although his direct influence is probably nil, his ability to see future developments is again impressive. The house, city, and its substantial bomb shelter are featured prominently in the novel Farnham’s Freehold. The house was sold when the Heinlein’s moved to Santa Cruz in the mid-1960s. Mystery/thriller writer Robert Crais, a Heinlein fan (who puts at least one Heinlein reference in each of his bestselling novels), visited the house in about 1998 and was allowed to visit the bomb shelter and take pictures. Top 10: The architecture of Star Wars, Architects’ Journal . “In a 1967 essay on minimalism, Clement Greenberg, America’s most influential critic, could have been describing Star Wars: “Everything is rigorously rectilinear or spherical. Development within a given piece is usually repetition of the same modular shape, which may or may not be varied in size.” Greenberg rejected minimalism as pedestrian. “Minimal works are readable as art,” he wrote, “as almost anything is today, including a door, a table, or a blank sheet of paper.” Perhaps because of its fantastic nature, the Death Star has never been recognized as an essential work of minimalism—but it is one. “Its destruction has never been acknowledged as a turning point for modernism—but it was one. Lucas unabashedly emulated the visuals of Stanley Kubrick’s film 2001: A Space Odyssey (1968),which incorporated the principles of modernist architecture (spare, utilitarian, evenly lit spaces) and the presence of a minimalist slab (colorless, drab, depersonalized, inscrutable non-art). The only ornamental flourishes in the film were borrowed from NASA (whitewashed modular construction pocked by latches, struts, and access panels) and corporate furniture design (steel, leather, powder-coat enamel, and blobby red Dijinn). 1) Digitization of the envelope of a traditional habitat. 2) Scooping out hollows within this volume as if it were an ice cavity, but in full wood by a 5 axes drill machine. 3) Water states and flows vary according to the seasons: The ice flows and freezes; the ice façades freeze and melt, forming a pond in front of the building. 5) Construction by CNC machine processing, 5 axes, in full wood (2000m3-1000 trees) and reassembling the manufactured 180 pieces on site. Amorphous mutations that suddenly get the form of an art museum that will be finished in 2009, it seems that R&Sie architecture evaluates architecture’s degree of reality transforming pieces taken out of a plastic dimension to convert them in high quality architecture. The museum, designed with the most organics forms that we can find in nature, clearly represents the team philosophy of “Making with…”, that is their way of describing their research into a critical experience of architecture through a mutation of contextual parameters. As François says in their web-site, scenarios of hybridization, grafting, cloning, morphing give rise to perpetual transformation of architecture which strives to break down the antinomies of object/subject or object/territory. R&Sie(n) is an architectural office set up in 1989 and lead by François Roche (1961, France), Stéphanie Lavaux (1966, France), based in Paris. The organic, oppositional architectural projects of their practice is concerned with the bond between building, context and human relations. Roche explains his concept of ‘’spoiled climate” chameleon architecture, which links and hybrids the human body to the body of architecture by a re-scenarization on the rules of all the natures, even artificial. They use speculations and fictions as process to dis-alienate the post-capitalism subjectivities, in the pursuit of Toni Negri. R&Sie(n) consider architectural identity as an unstable concept, defined through temporary forms in which the vegetal and biological become a dynamic element.